My apologies for the delay but once again I’ve been traveling. And as usual, upon my return to reality I feel a bit heavy and, well, stuffed. Good eating (especially on vacation) is a life-long love of mine but once back home I always decide it is time to lighten up and eat right. This would be much easier if it actually felt like Spring here in Chicago, but alas, the Polar Vortex still seems to have a firm grip on Chicagoland and the winter-that-just-won’t-quit … well, apparently it just won’t quit!! Therefore I am torn between my continued craving for comfort food and my new-found yearning for lighter, healthier food. What is a girl to do?? 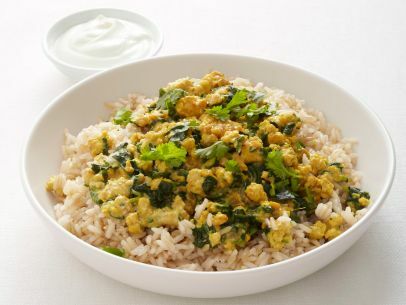 This girl turned to one of my new favorites – Spinach Turkey Korma on brown rice. It is a bowl of food you can really tuck into and it just warms you up and satisfies. But it’s healthy!! And light!! Bonus! The recipe comes from Food Network Magazine and if you have the slightest inclination to try a healthy Indian bowl of yumminess — try this. Your soul and your waistline will thank you. A quick note on the picture and the recipe itself. My picture just didn’t do the dish justice, so this one is from the magazine’s website. And anyone who had read more than two of my recipes knows I detest cilantro. Therefore I replaced cilantro with parsley. You do what you feel is right. I won’t judge, but might just wrinkle my nose at you a bit. Puree half of the onion, 2 tablespoons water, the ginger, garlic, curry powder and 1/2 teaspoon salt in a food processor until almost smooth; set aside. Mix the yogurt with 1/4 cup water in a small bowl; set aside. Heat the vegetable oil in a large skillet over high heat. Add the remaining onion and cook, stirring occasionally, until lightly browned and tender, about 3 minutes. Add the turkey and cook, breaking up the meat with a wooden spoon, until lightly browned, about 3 minutes. Add the onion-spice mixture to the skillet and cook, stirring occasionally, until dry, about 4 minutes. Reduce the heat to low and stir in the spinach and the yogurt mixture. Cook, stirring, until warmed through, about 3 minutes. Stir in the parsley and 1/4 teaspoon salt. Serve over rice with more yogurt and topped with parsley. 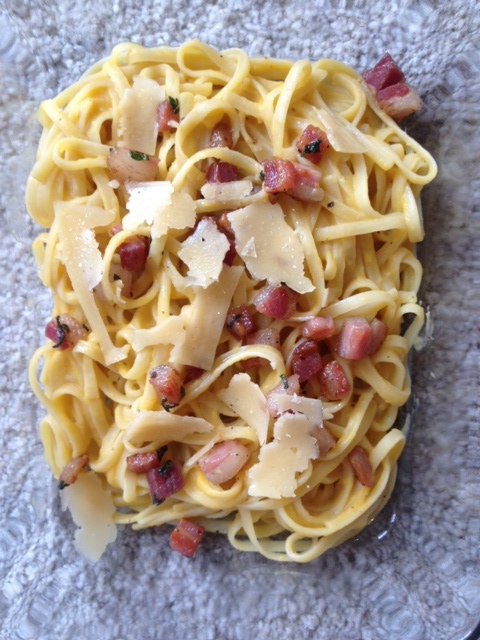 Pasta Carbonara is one of my all time favorite dishes in the world. Oooey, Goooey pasta tossed with eggs, cheese, sometimes some cream. What’s not to like? Well, OK, the calories, the fat content, etc… but you gotta admit, it’s awfully tasty! So when I saw this recipe for “Carbonara” in Bon Appetit, let’s just say I was skeptical at best. But the picture sure was pretty. And I do like butternut squash. And it kept the pancetta. So why not take it for a spin. It was amazing!! Rich beyond comprehension considering the ingredients. Luscious, creamy, (creamy!! how can it be creamy??) and totally satisfying. I immediately sent the recipe to my good friend whose husband can’t eat dairy and said “You must try this”! Seriously, even if you are a dairy fiend like me you won’t miss it. It is a guilt-free version of a very guilt-laden favorite. Heat oil in a large skillet over medium-high heat. Add pancetta, reduce heat to medium, and cook, stirring occasionally, until crisp, 8–10 minutes. Add sage and toss to coat. Using a slotted spoon, transfer pancetta and sage to a small bowl; set aside. Combine pasta, squash purée, and 1/4 cup pasta cooking liquid in reserved skillet and cook over medium heat, tossing and adding more pasta cooking liquid as needed, until sauce coats pasta, about 2 minutes. Mix in 1/4 cup Pecorino; season with salt and pepper. Weekly Winner: In Desperate Need of a Salad — But Kale?? 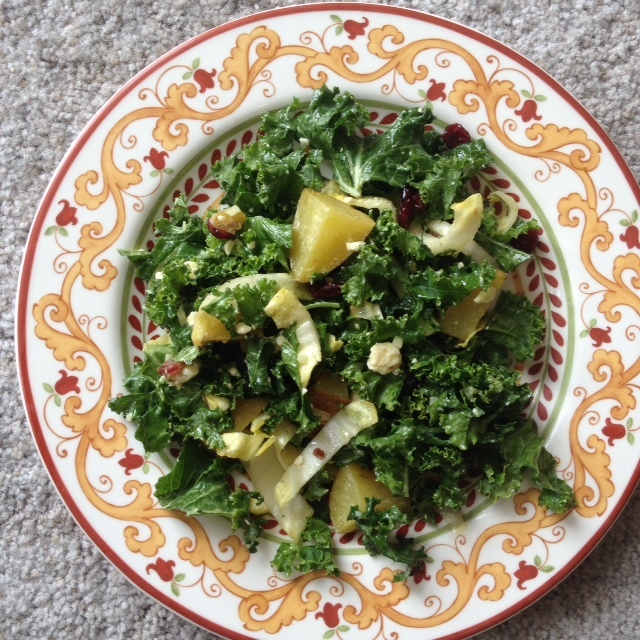 I seriously never, in a million years, thought that I would be posting a Weekly Winner recipe that involves raw kale. Seriously, it was not going to happen! But then it did. Generally, I do not have anything against kale if it is cooked in something. Raw, it is just too much. But then I desperately craved a salad. In this unrelenting-never ending-won’t-even-get-to-freezing winter that we continue to endure here in Chicago, I have burned out on every soup recipe I own. I wanted a salad! But alas, the winter continues and therefore the produce offering is still on the slim side. Decent tomatoes are hard to come by and the lettuces are all still looking a bit suspect. As it so happened, I clipped this recipe from Eating Well magazine (go figure!) and thought, “How bad could it be?” I mean, it does have bacon, blue cheese and potatoes in it. I figured it would be substantial and filling. What I didn’t really expect was for it to be so dang good! The combination of flavors was amazing — who thinks to combine honey-mustard and blue cheese?? That’s just crazy!! But it works. It really works. Seriously, this will give any spinach salad a serious run for its money. Try it and see if you don’t agree. Toss potatoes, 1 tablespoon oil, thyme and 1/4 teaspoon each salt and pepper in a large bowl. Spread out on a large baking sheet (reserve the bowl). Roast the potatoes, stirring once or twice, until tender and browned, 15 to 20 minutes. Place kale in the large bowl, add the hot potatoes and let stand for several minutes, tossing occasionally, until the potatoes are warm but not hot. Meanwhile, whisk the remaining 2 tablespoons oil, vinegar, blue cheese, shallot, mustard, parsley and the remaining 1/4 teaspoon salt and pepper in a small bowl. Drizzle the dressing over the warm salad. Add bacon, endive and currants (or cranberries); toss to combine. Serve immediately. I’ve made no secret of my deep, abiding love of pork. 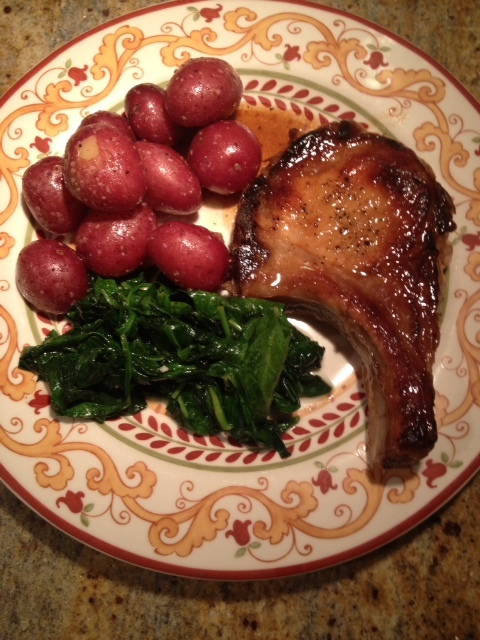 There is not a cut of pork that I’d refuse, but my hands-down favorite has got to be thick-cut, bone-in pork chops. A large part of this is definitely due to my deep, abiding love of my butcher shop https://donnasquickqi.wordpress.com/2013/07/12/weekly-winner-an-open-love-letter-to-my-butchers/. Having divulged all this love, I might as well continue and say that without a doubt, this is my favorite preparation of my favorite cut of my favorite type of meat. The recipe is Sweet and Spicy Thick-Cut Pork Chops and it comes from Cooks Country Magazine. Last night I decided it was time to return to basics. Meat, potato and vegetable. It has been awhile since we sat down to what I consider a real, Midwestern dinner. This was it and it totally hit the spot. 1. Whisk cider, brown sugar, vinegar, garlic, mustard, hot sauce, and cornstarch in medium bowl. Pat chops dry with paper towels. Following photo 1 at right, cut 2 slits about 2 inches apart through fat on each chop. Rub chops with oil, season with salt and pepper, and sprinkle 1 side of each chop with granulated sugar. 2. Place chops sugared-side down, in large nonstick skillet. Place skillet over medium-low heat and cook until chops are lightly browned, 10 to 12 minutes. Following photo 2, flip chops; add cider mixture, and cook, covered, until center of meat registers 145 degrees, 8 to 10 minutes. Transfer chops to platter. Increase heat to medium-high and cook, uncovered, until liquid is thick and syrupy, about 5 minutes. 3. Return chops to skillet and turn to coat with glaze. Transfer chops to platter and top with remaining glaze. Serve.